Yesterday I visited a new museum. I always love viewing art but seeing a new museum open during a time of economic despair made my heart sing…and to visit it with a friend was even better. 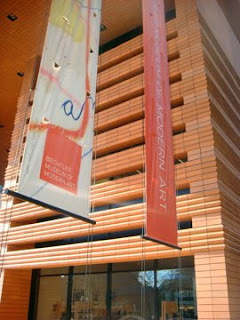 Janette Grassi and I visited the Bechtler Museum of Modern Art in Charlotte, NC on a glorious winter day. 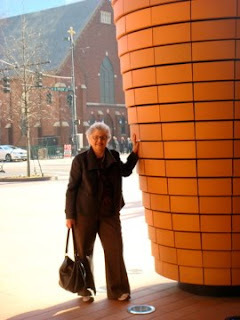 The sky was blue which provided an incredible backdrop for the terra cotta-tiled museum designed by Swiss architect Mario Boatta which houses the personal collection of mid-20th century modern art of Andreas Bechtler which now belongs to the city and people of Charlotte. I sensed a feeling of familiarity upon seeing the building and soon realized why. Boatta, a personal friend of Bechtler, also designed the San Francisco of Fine Art (SOFA) which I visited a few years ago. 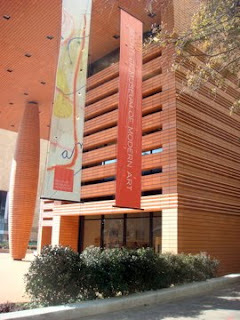 The building itself is a work of art but the fourth floor gallery was a sight for my art deprived eyes. I was especially drawn to a small piece by Paul Klee on burlap. The swelling column at the front entrance hints of a spinning textile spool and to the textile history of the region. The second floor balcony which houses several pieces of sculpture also provided an incredible view of the city skyline and the new site of the Mint Museum which is scheduled to open next year. Andreas Bechtler gave a huge gift not only to the city of Charlotte but to me. (Click to enlarge). 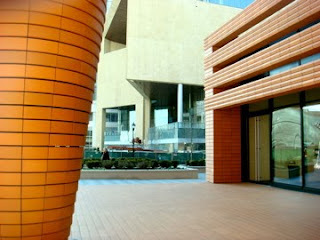 Bechtler Museum of Art. (Click to enlarge). Janette Grassi. (Click to enlarge). 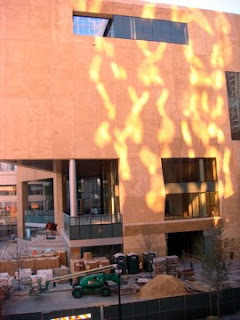 Light dancing on the walls of the Mint Museum. Laughter heals what ails you.